Man, that's awesome ! Those robots are all very 40ties bunker type ("clonk, clong, brrrrr ..."). Flamethrower-Phantomas works too. The Cyclops is my favorite of the bunch. Hell, yeah, give them battle scars and bullet holes ! If you can finish them in May, then this will be Master Hoard. here's a work in progress shot. Any suggestions on how tall the finished model should stand ? I was thinking larger than man sized, probably 2-3 inches tall. I generally like to see robots about half a head or a full head taller than humans. I put a human sized cyclopsbot in with heroes for the may submission. I've also have 2 giant sized ones with german markings in the works. The 1st is a larger version of the original with additional details and the second is a completely new drawing in a more dynamic pose. I'm excited to see an imagined army of german clunkers marching across the battel field. I've also a cleaned up version of the walker that I'm going to paint up and mark for the allied forces. With any luck the May Horde will have heroes, robots, and zombies a plenty for a brutal Weird War Skirmish. I love the pose, but not the final position of the head and raised arm. It's been redrawn since then and have two versions of it. Hopefully, I'll get them colored before the end of the month. Very nice. And better, now. It's a little less retro now, but retro robots are designed soo badly it's hurts me. Their lack of realistic joints makes it difficult to translate motion, or pose other than standing there. The original sketch unintentionally had two different elbow types, and the head was too far forward. 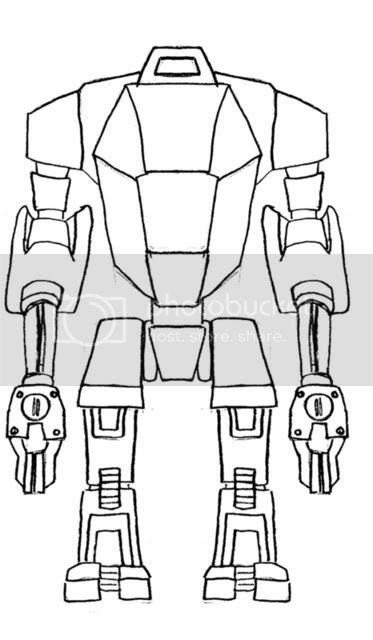 The head position would have been okay on anything with a human like neck, but I picture the robot with more of a rotating head mounted on top of a disk, and not having the range of motion that a human neck would, so it looked off, from the perspective of how I imagined it. 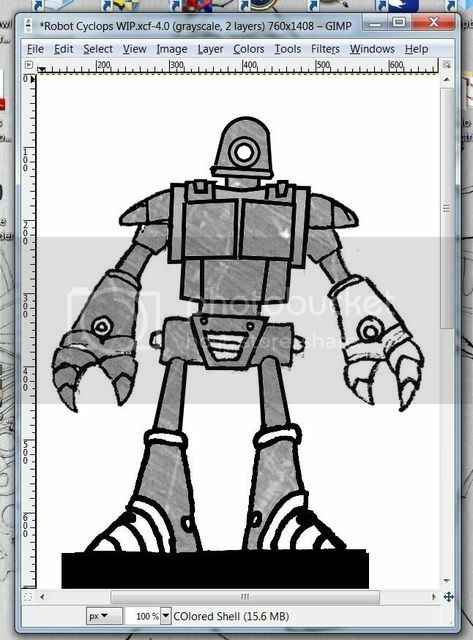 I have 2 more droids I just sketched out as well, but they are decidedly less retro and more Deathwalker like. I'm going to hold off on finishing them for now, since their not part of this months theme, and I may use them for a future project I have in mind. Holy doody, this one is menacing, Adam ! Powerful Strike Pose ! Very well done. I am late on the Zombies (as usual). But I will finish them around (!) end of month, I promise ! 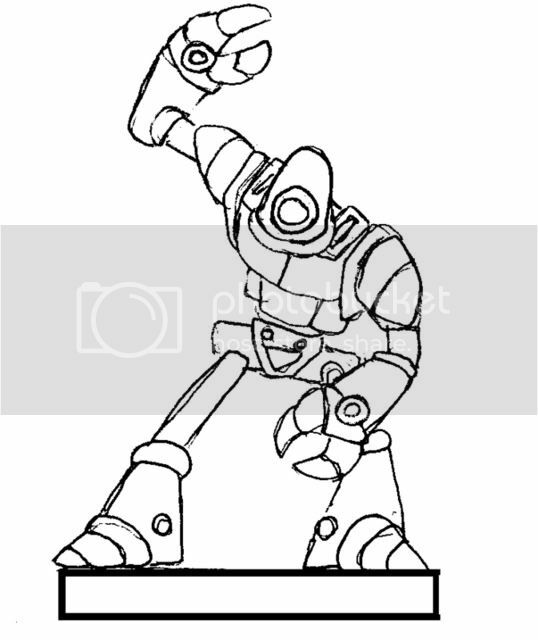 I'm going to concentrate on them tommorow night and try to have 3 cyclobots done for the May Horde. It would be splendid if you get the zombies finished in time as well. I'm excited to see what you have done with them. I started to color the back art when I realized I drew it incorrectly. The outlines matched up, but which shoulder is forward doesn't. I knew something didn't look 100% right, and it took me until now to realize what it was. I've already redrawn it, but it will set me back a bit. I'd enhance the contrast between light and shadows, but i like that robot a lot. Its simplicity and its dynamic pose made it a masterpiece. I agree. This robot is fantastic! Thanks guys !! It means a lot to me that you enjoy it. This is really the first model I've tried applying shadow and highlight too. I'm going to try tweaking the highlight and shadow levels and I'll post a comparison shot. I had 3 poses sketched out originally. 2 are already in this months horde, but one got shrunk down. It's on my to do list to get the 3rd pose done eventually. They'll probably end up re-released together. maybe with a bit more refined coloring. Paladin mentioned he might want to take a crack at coloring them. If he does I'll be happy to supply the line art for all three so he can work his magic on them. These robots are gorgeous! I'd love a crack at colouring them. Did you say they are three? How big are they supposed to be (in relation to human?) in mm (saying that humans are 30mm at the eyes)? WOW, I'm glad there is an interest in my shiny little creation. I'd be happy to share. I'm at work at the moment, I'll get up a blank copy of the robot tonight, probably around midnight EST. I only eye balled the scale, but figure roughly twice as tall as a man, so 60mm seems about right if he was upright. The thumnailed images should be the appropriate height when printed at 300DPI. 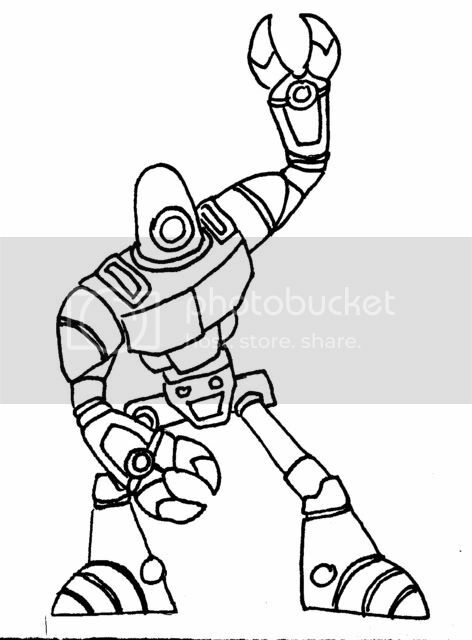 For anyone who would like to take a stab at coloring the big bad robot, you have my blessings and I eagerly await to set see what you can do with the beast. Hopefully I'll learn from your example. Just click on the thumbnail for the larger image. Man, yes, this is magic . Picked it. Would be awesome, if okumarts and Parduz give it a shot. I guess, we will get very different versions ... . I had an experiment in mind. I would use material/bump effects. I suppose, the robot would look somewhat like a shot of a real mini then. The "tracing" and the "Making all closed shapes" process changed it a bit. I tried to stay close to the original lines as much as i can. Hope you don't mind, Adam.